Moles grow to a length of around 15cm. and weigh approximately 100 to 150 grams and are found in most of lowland Britain, they are active all year round. They have a lifespan of up to 3 years. 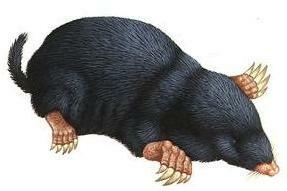 The mole is rarely seen, spending most of its time underground in soil. Their favourite food is earthworms. Moles are very active animals, working both day and night, and only stopping for short periods of rest, you can see where the mole is tunnelling, because every few metres they rise to the surface with a heap of freshly excavated soil. The placing of purpose built traps is the most effective form of Mole control. The traps are checked daily minimising animal distress. Once caught the Mole is removed and disposed of sympathetically and humanely.